Corry Contract was featured in the fall 2014 article “Beyond the Legacy Laser” for the state-of-the-art Salvagnini fiber laser. Thanks to Nick Wright from FF Journal, “the magazine for today’s metal fabricating and forming technologies.” In order to download this article as a PDF, click here for the FF Journal 2014. Above: Corry Contract mainly uses compressed air as an assist gas, though the L3 also uses nitrogen and oxygen. September 2014 – A term that the metal fabricating world regularly uses to describe large, expensive pieces of equipment that last for years is “legacy system.” In this industry, it refers typically to an outdated, older machine that still does its job but might not be worth replacing with new and better equipment due to the legacy system’s high initial cost. We hear it in reference to CO2 lasers especially. Depending on who you ask, it’s no secret that legacy CO2 lasers are going by the wayside as fiber lasers emerge as the preferred laser cutting technology. Some CO2 lasers will last a decade or more. However, as machine OEMs taper off support for CO2s and focus on fiber lasers, we might not be calling older machines legacy systems for long. One contract metal fabricator, Corry Contract Inc., recognized that investing in a fiber laser was the logical next investment in replacing one of its fast axial flow CO2 laser cutters. To that end, Corry Contract invested in an L3 fiber laser cutter from Salvagnini American Inc., Hamilton, Ohio. It’s a 3 kW machine, however Salvagnini has 2 kW and 4 kW versions as well. Although it already had a relationship with Salvagnini from buying one of its panel benders in 2005, Corry Contract chose from a manufacturer that takes its fiber lasers seriously—Salvagnini no longer even offers CO2 lasers. Since Corry Contract purchased it in 2012, the L3 has generated gains in efficiency and ease of use. Located in Corry, Pennsylvania, about an hour outside of Erie, the custom job shop does work for a variety of products and markets. It cuts mild steel from 24 gauge to 1⁄2 in. thick, as well as stainless, aluminum and copper in varying grades and thicknesses. Its customers are primarily in industries such as locomotive and mass transit, electrical power generation and distribution, and machine tool components. Corry Contract also has a proprietary line of office furniture, called Corry Metal Furniture. Products include inverter boxes, control cabinets, power disconnect cabinets, tanks, desks and storage cabinets. Founded in 1979, the business occupies a total 190,000 sq. ft. More than 100 employees work mainly on first shift with a small second shift as needed, such as for maintenance. “We cut, form and weld the raw materials and then paint and assemble them for our customers,” Kafferlin says. Since adding the L3, the number of mirrors on the machine has been reduced to one. Kafferlin explains that the old CO2 resonators were sensitive to vibration and temperature. Not so on the L3: It sits on casters and can be moved around while it’s working. Plus, it has its own chiller to control the temperature. The L3 also has more laser source diodes than required to produce 3 kW, so if some of them failed over time, others would kick in to maintain the specified wattage. While the L3 fiber laser is a decidedly better laser cutting option than another CO2, part of the value in Corry Contract’s machine is the included material handling option. The L3 can load material for the next job by itself, Kafferlin says. “While this takes up floor space, it allows for the machine to be run unattended at times.” Some jobs and materials are better than others for this, such as parts with “tip ups.” Coated materials are also tricky, so they’re usually processed with an operator present. 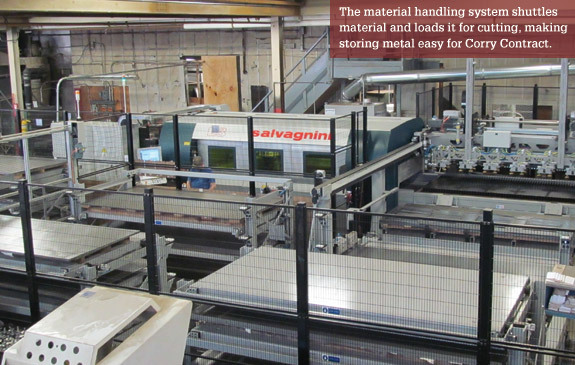 “The key for the Corry project was the material handling configuration and the ability to fit everything into the space allowed,” adds Bill Bossard, president at Salvagnini. Salvagnini first shipped its fiber lasers—now the L3 and L5—in 2009 after debuting the technology at the EuroBlech expo in 2008. As FFJournal reported in 2009, Salvagnini’s counterparts in Italy, where the world headquarters are located, decided to build a laser around IPG Photonics’ fiber technology. Salvagnini was considered the first to manufacture a fiber laser cutting machine. While the company is mum on how many L3 lasers it sells, Bossard says it’s more than 100 each year. At the core of the L3 is IPG’s YLS-3000 (3 kW), which lets Corry Contract cut 11 gauge mild steel at 85 ipm, 14 gauge at 175 ipm, and 20 gauge at 200 ipm, to put the machine’s capabilities in perspective. Salvagnini allows air as an assist gas from 14 gauge to 24 gauge. Plus, downtime associated with 1,000-hour checks necessary for older CO2 resonators and slab resonators is eliminated. “We have seen a reduction in consumables—mirrors, lenses and copper parts,” says Kafferlin. The L3 creates a smaller heat-affected zone and less oxide buildup, while providing higher wattage. Corry Contract usually uses compressed air instead of pure oxygen or nitrogen. “We still have those gases available for special situations but often don’t need to use them,” he adds. As fiber laser cutters like the L3 gradually appear in more fabrication shops, the CO2 machines they’re often replacing will disappear. It takes the work of manufacturers like Salvagnini, which got out of the CO2 business altogether to focus on fiber, and forward-looking fabricators like Corry Contract, to maintain the shift to faster, cleaner cutting technology.